When colleagues provide you with major help at work, lend a hand when you're in a jam, assist with a challenging project, or just generally go above-and-beyond what's required, it's a kind gesture to send a letter of appreciation. You can also send a note or email message to a colleague who has covered for you while you were out sick or on leave. Sending a letter of appreciation lets colleagues know that their hard work and help is noticed and valued. Everyone likes to know that they are appreciated and taking the time to show that you've noticed always makes a good impression. It also helps to build and maintain a work climate that is positive and congenial. If you are a new employee fortunate enough to have attracted a volunteer mentor, by all means, you should write a note to thank them for taking time away from their own workload to help you with yours. If you are leading a team, you might want to send out a team-wide email of thanks when you pass key milestones and, ultimately, complete a project. 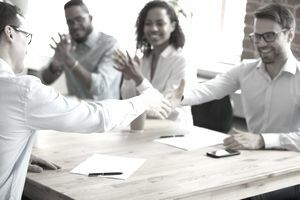 Team members who feel that their contributions have been publicly affirmed are much more likely to give their best effort than those who never hear a word of praise and think that they are being taken for granted. If you are emailing a co-worker, you can also copy the person's manager. It's always nice to let people with power over promotions and raises know when their employees are performing well. An email is the quickest way to say thank you, but a handwritten note or letter always makes a good impression. It shows that you have taken an extra step to show your appreciation for the assistance provided by a colleague at work. Below, you will find sample appreciation letters to send or email to an individual or individuals who have provided help at work. Use these examples as inspiration and guidance when you are crafting your own thank-you note. Thank you for all your wonderful contributions during our recent departmental restructure. It was really helpful to have your input, since you went through a similar reorganization in your department last year. We’re already seeing a vast improvement in efficiency thanks to the streamlined processes you suggested, and I'm confident things will run smoothly as the company continues to grow. I really appreciate your guidance, and the time you spent with me to make this transition go well. Thank you all for your tremendous help launching the XYZ project. Without your diligence, hard work, and several late nights and early mornings, we would not have been able to meet our deadline. And we did so much more than that: thanks to everyone's major efforts, we not only launched on time, but with a wonderful result. Your hard work has not gone unnoticed, and I, along with the entire senior management team, would like to express my deep gratitude to each and every one of you. I’d like to thank you, most sincerely, for all of the help you’ve given me since my hiring at XYZ Company. Onboarding is both an exciting and a nerve-wracking process, but from the very beginning you have made me feel welcome in our department. I especially appreciate all of the time you’ve taken from your own work to “show me the ropes” and to ensure that I have the process knowledge and tools I need to do a great job each day. I’m extremely fortunate to have you as a colleague, and I look forward to the day when I can follow the example you’ve set in helping our new hires feel grounded and supported. When you write a thank-you letter to a colleague, opt for a more formal than casual tone. That's especially important if you are copying managers and colleagues on the letters. A breezy "Thanks for the help" email is nice, but spending the time to make sure the letter is well constructed may feel more meaningful. Your Letter Should Be Genuine: Avoid excessive flattery, which can seem insincere. Be specific in your praise, and explain exactly why you are writing the thank-you letter. No need to overthink your message — the most important thing is to make sure you say "thank you" in the letter. Before you send your letter, proofread to make sure you do not have any typos. Be particularly careful to make sure you've spelled the recipient's name correctly. Don't Delay Sending Your Thank-You Letter: While you do want the message to be thoughtful, it's also important to not let too much time pass between the event or favor that warranted thanks, and you sending your letter. Don't Forget That Bosses Like to Know They Are Appreciated Too: Here's a sample thank-you letter for a manager, with tips for what to include. Here's more information on how to write a thank-you letter, including who to thank, what to write and when to write an employment-related thank-you letter. Review more appreciation letter samples — remember, it's important to thank anyone who helps you throughout your career and job search.